The festival properly begins on the first day of the first lunar month in the Chinese calendar. The Chinese people used the lunar calendar for more than two thousand years. However, after the establishment of the People’s Republic of China in 1949, the government officially adopted the Gregorian calendar. According to historical records, the Chinese have been celebrating the Spring Festival for more than four thousand years. A popular way for the Chinese to refer to the Spring Celebration is guo nian, or “celebrate/welcome the new year”. In folklore, the traditional Spring Festival starts on December 23rd of the lunar calendar, and ends on January 15th of the upcoming year, or the day of the Lantern Festival. The highlights are on the New Year’s Eve and first day of the New Year. During this period, there are many traditional activities. As a popular Chinese rhyme goes, “twenty-three, sacrifices to the stove official; twenty four, sweep the house; twenty five, make tofu; twenty six, steam buns; twenty-seven, kill the rooster; twenty eight; kill the duck; twenty nine, drink the good wine; thirty, appliqués on the gates; the first, go out of the gate to see good omens and good luck descend upon the house”. Like in many other cultures, the arrival of the New Year is a time to start anew with a clean slate. Adults buy new clothes and children are given a completely new outfit. Before the Spring Festival, every family must thoroughly clean and wash everything inside the house. No cleaning is allowed on the New Year’s Day as it might “sweep away” all the good luck that the New Year brings along. This example illustrates how superstition is a very dominant factor of Chinese belief. As a matter of fact, superstition is involved in all aspects of everyday life in China and it can often influence decision-making. After the family does the clean-up, they will paste paper-cut decorations and paintings on their windows and doors. The most popular paper-cut designs are usually the ones that depict the zodiac animal of the year, or a design that implicates happiness and good fortune. Another tradition is to paste the Gate God on the doors. The story is that these two dignified deities can defeat the evil spirits, and ensure the family’s safety in the coming year. Because the traditional Chinese gate opens up on both sides, the Gate Gods come in pairs. Some families will also paste the word “auspiciousness” on their doors in the hopes it will bring peace and good health for the family in the coming year. The Spring Festival Couplet evolved from the Gate Gods. Every year before New Year’s Eve, whether the family is rich or poor, educated or not, everyone must put on the Spring Festival Couplets to symbolize the hopes for the upcoming year. 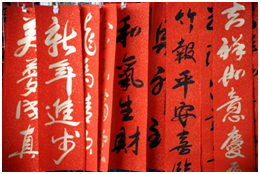 Propitious words are written on red paper to bring good luck - the color red is a meaningful symbol that dominates Chinese culture: apart from the obvious political connotations, red also stands for virtue, joy and sincerity. It also symbolizes auspiciousness, since the Chinese word for red, hong, also sounds like the word for “prosperity”. As a result, red is considered an auspicious color as well. Family is one of the most important pillars of Chinese culture and the Spring Festival is thus the traditional time for family reunion. On New Year’s Eve, or chu xi, the whole family must sit at a table to eat the New Year’s supper together. This meal is usually made from scratch with the entire family working together – cooperation is another key factor to understand Chinese culture, where the group or the community takes precedence over the individual. Whether the family is poor or rich, this meal is usually the most sumptuous meal of the year. In the New Year’s supper, it is essential that some dishes contain the family’s wishes for the New Year. Nian gao, or the New Year’s cake, is a very common Southern China dish made from glutinous rice. Because it sounds like nian nian gao in Chinese, or “better life each year”, it is a stable dish on the dinner table on New Year’s Eve. Once again, we can notice how language and superstition are deeply involved in the Chinese New Year celebration and how they can even dictate the menu. Jiao zi, or the stuffed dumpling, is a very common Northern Chinese dish. It is considered a New Year’s dish because its shape resembles the silver pieces of Chinese money during the feudal times. Therefore, the dumpling symbolizes wealth and success. When making these dumplings, coins and candies will usually be put into a select few. Those lucky family members that happen to eat those special dumplings during dinner are believed to have especially good fortune in the upcoming year. Fortune and money play an important role in Chinese culture. As a matter fact, one the most common traditional greetings in Chinese during the New Year celebration is gong xi ni fa cai, which can be translated as “I wish you get rich”; even Chinese statesman Deng Xiaoping once claimed that “to get rich is glorious”. It is interesting to observe how money is deeply rooted in Chinese culture, where money is not a taboo topic of conversation - for instance, asking someone about their salary is not considered rude or impolite. On New Year’s Eve, the entire family will eat supper, chat and play games until midnight. When the bell of the New Year rings, Chinese people across the nation will light firecrackers and fireworks to celebrate the coming of the New Year. As the fireworks lights up in the night sky, people will pay the New Year’s call to their friends and relatives to express the New Year’s blessings. After the younger generation pays the New Year’s call to the elder, they may receive the New Year’s money. The belief is that the New Year’s money can suppress evil spirits and let the children pass the coming year safely. Today, the New Year’s money is put into a red envelope, called hong bao. Usually the children will save the money to purchase toys and school supplies. This could be also regarded as a cultural difference between China and other countries where buying gifts to children is more common than giving them money. Being a direct reflection of Chinese culture, the Chinese New Year celebration evidences that China stays committed to its millenary traditions and beliefs while embracing modernity at the same time. Moreover, it also gives us some clues to understand cultural differences between China and the West, especially those related to family relationships and hierarchy.